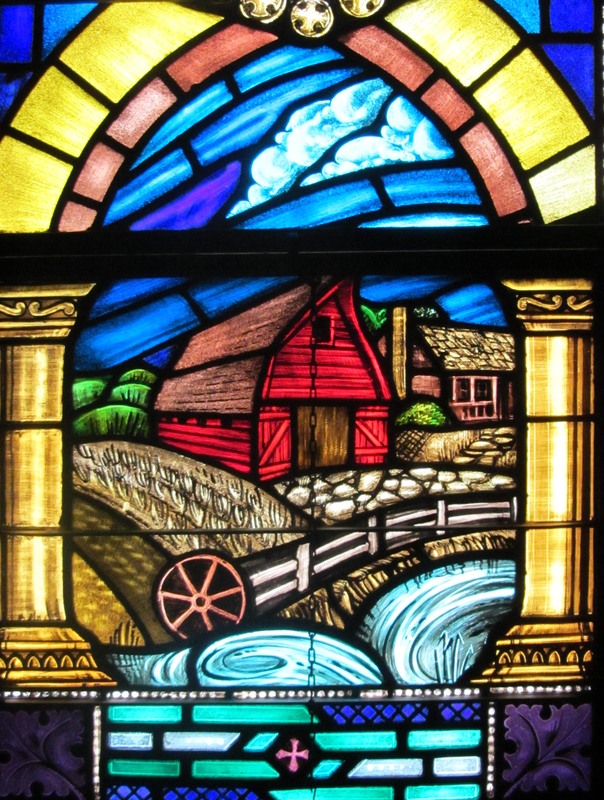 We continue our exploration of stained glass in Kansas City religious institutions with a visit to the Central United Methodist Church at 5144 Oak Street in Kansas City, Missouri. This congregation is one of the oldest in Kansas City, with an impressive history of charitable contribution and involvement in the community. This congregation was organized in 1844. The first members attended meetings in a walnut grove. At that time the congregation was served by itinerant preachers on a circuit with other Methodist churches in Westport and Independence. Later meetings were held in a log schoolhouse. A brick church was erected in 1852. The congregation moved five times after that to locations at Fifth and Wyandotte Streets (1852-1875), Ninth and Walnut (1875-1881), Ninth and Lydia Avenue (1881-1907), Eleventh and Paseo Boulevard (1908-1933), 59th and Kenwood (1933-1939), 52nd and Oak Streets (1939-present). The name Central Methodist Church was changed to Central United Methodist Church 1n 1968 when the Methodist Church merged with Evangelical United Bretheren to form the United Methodist Church. The first worship service in the present location was in 1939. A new education wing with chapel was completed in 1954. The original windows in this church were destroyed in a fire that resulted in extensive damage to the church and sanctuary in 1965. 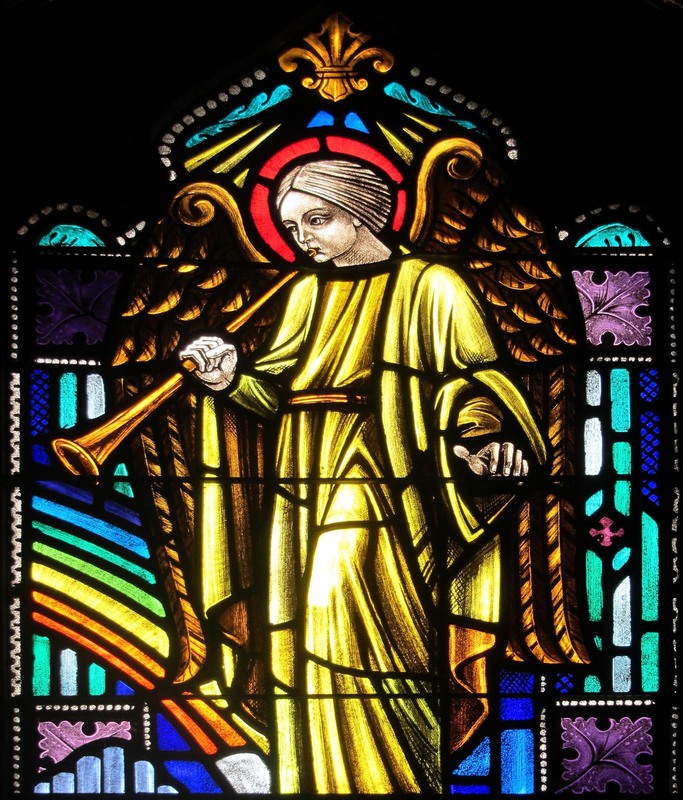 The present sanctuary windows were fabricated by the Hopcroft Art Glass Studio of Kansas City, Missouri and were installed in 1966. 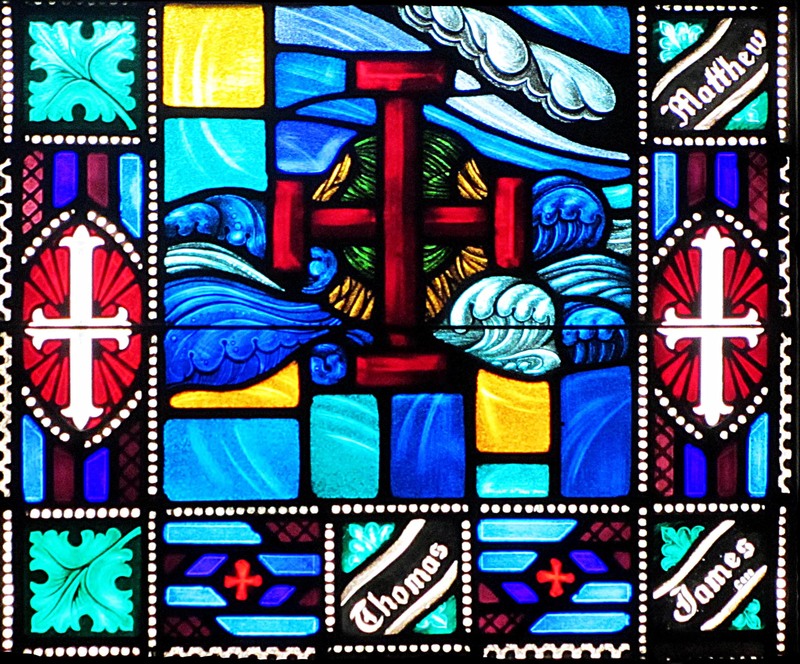 The windows in the Raymond A. Barrows Chapel were designed by Ronald Dixon, fabricated by Willet Glass Company, and installed in 1954. 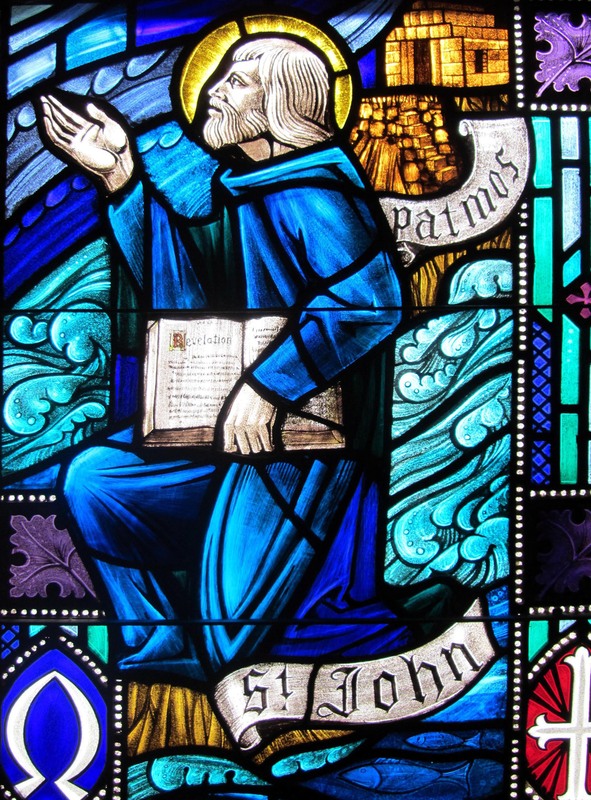 A complete discussion with illustrations of each of the wonderful windows may be found on the “Central United Methodist Church” page located elsewhere in this blog. Remember you can enlarge any image simply by clicking on it. 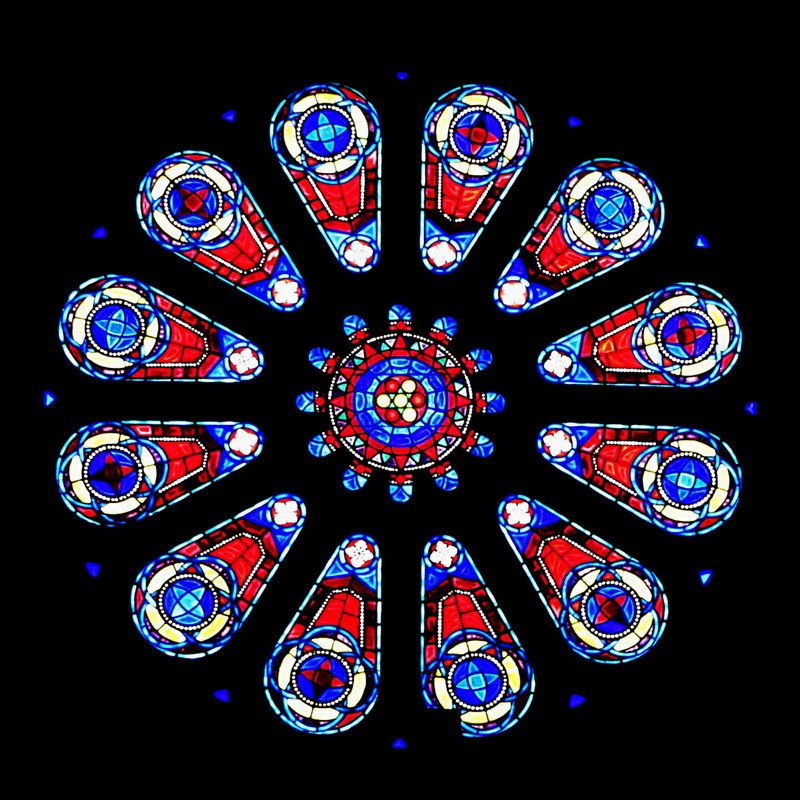 The Rose Window glows high above the altar in the front of the church sanctuary. 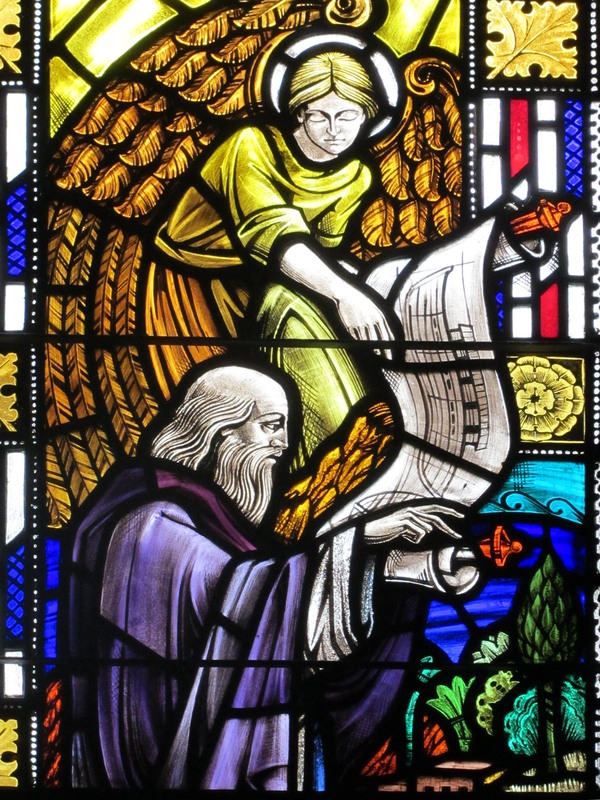 In the west transept, the Creation Window reveals Noah receiving the directions for building the ark from a heavenly messenger. We see the Angel of the Lord with his protective sword blessing the kneeling Adam and Eve. And then the deeply changed Adam and Eve being expelled from the Garden of Eden. Across the west wall of the sanctuary, four windows present important elements from the Old Testament, starting with the story of Moses, the tribes of Israel, the Prophets, and the Fruits of the Old Testament revealing the power of God working through man. 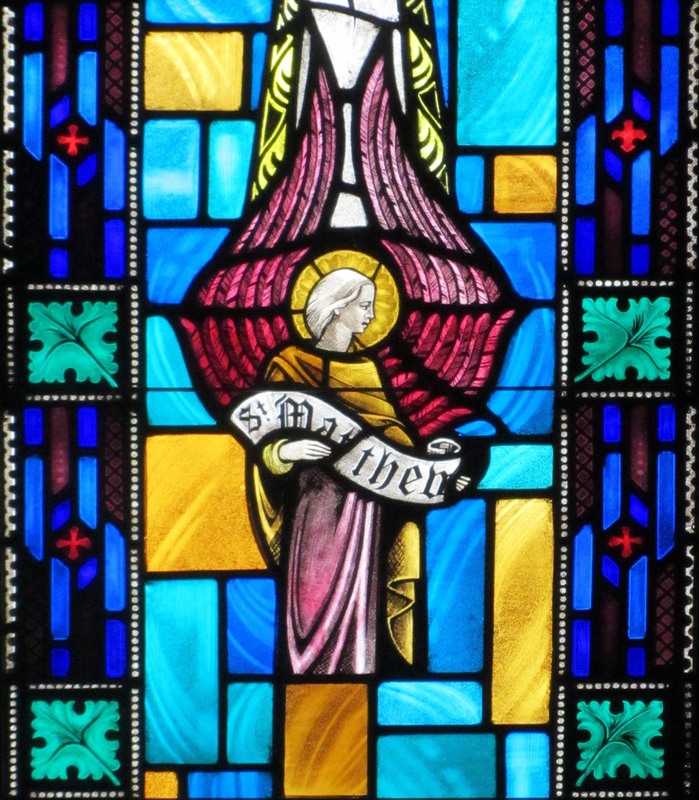 These windows, like the four on the east wall depicting important moments from the New Testament, are less figurative, each having two panels with two symbols in each panel representing important aspects of the window’s focus. 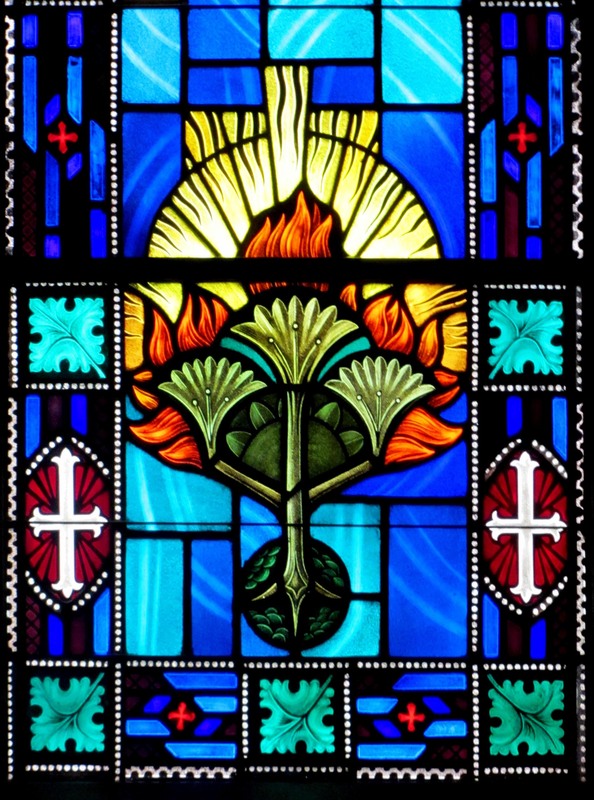 For example, the Moses Window shows an image of the burning bush and the two tablets of the law given at Mt. 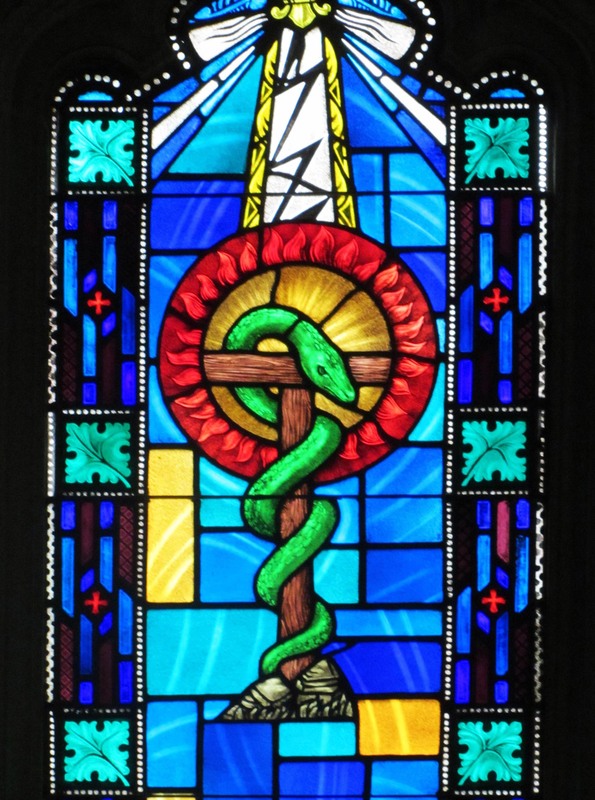 Sinai, and the healing tau cross and the serpent, as well as the scroll suggesting the beginning of formally organized religion of the Judeo-Christian heritage. 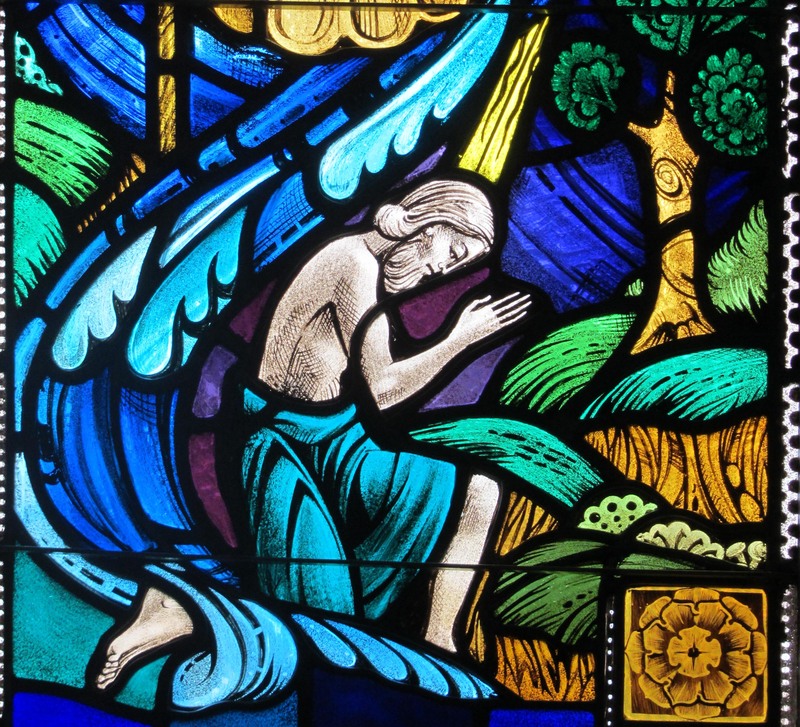 The east transept, across from the Creation Window, presents a beautiful expression of the New Creation. 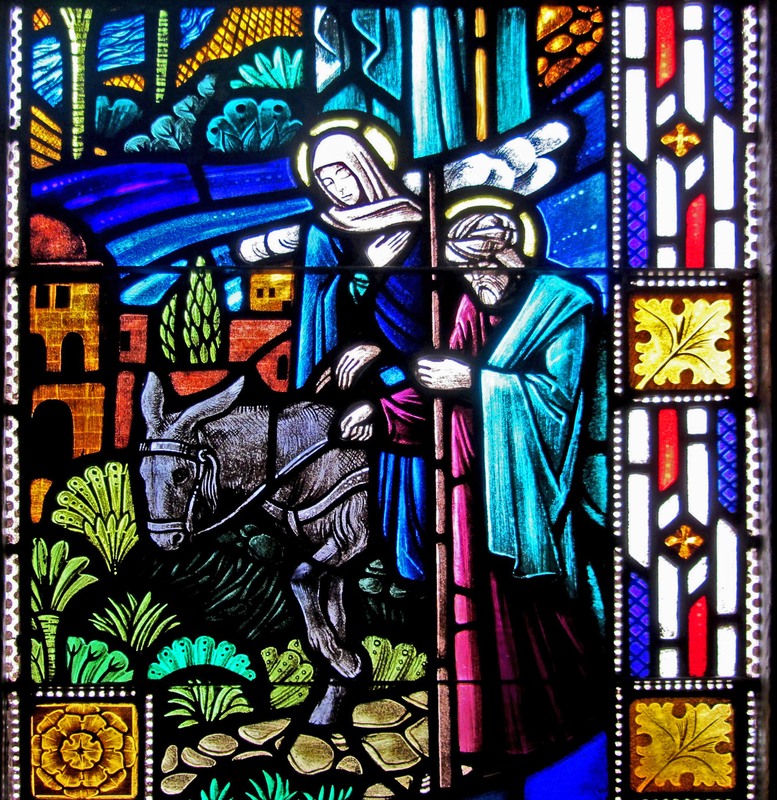 We see John the Baptist, Mary and the Angel Gabriel at the moment of the Annunciation, and Joseph and Mary making their way to Bethlehem. The four windows in the east wall of the sanctuary present important elements of the New Testament. 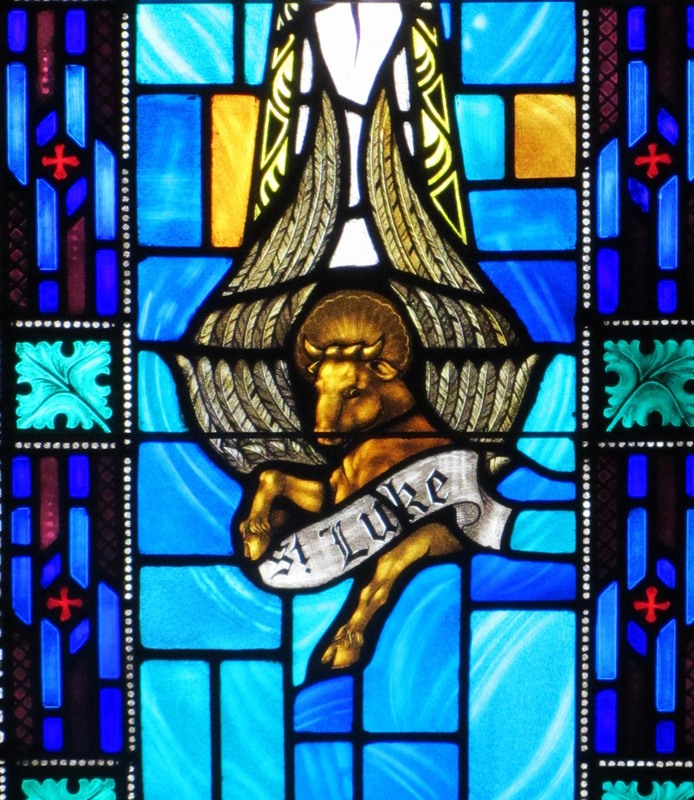 The Messiah Window includes a crib, the Greek letters Chi Rho, Shepherds’ crooks, and the gifts of the three kings. 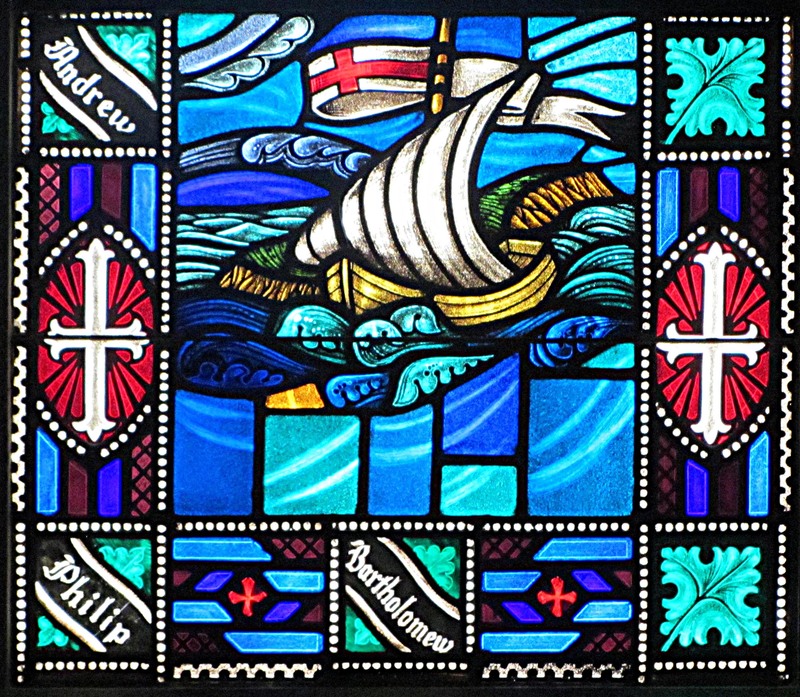 The Apostles Window includes symbols of their faith: Three drops of blood above an open Bible, a lamp of light and love illuminating the paths of all believers, a storm-tossed ship with a Christian banner, and a red cross of service and concern. 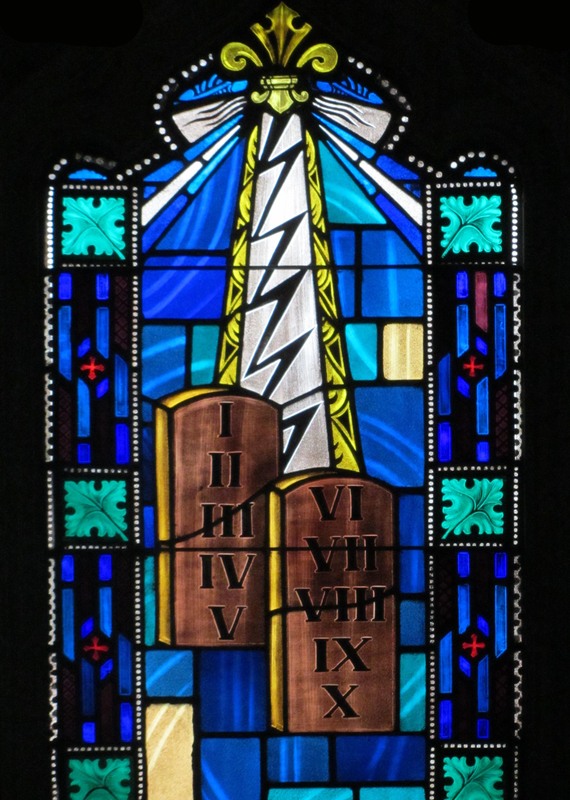 The Evangelists Window displays the time-honored symbols of the four Evangelists. 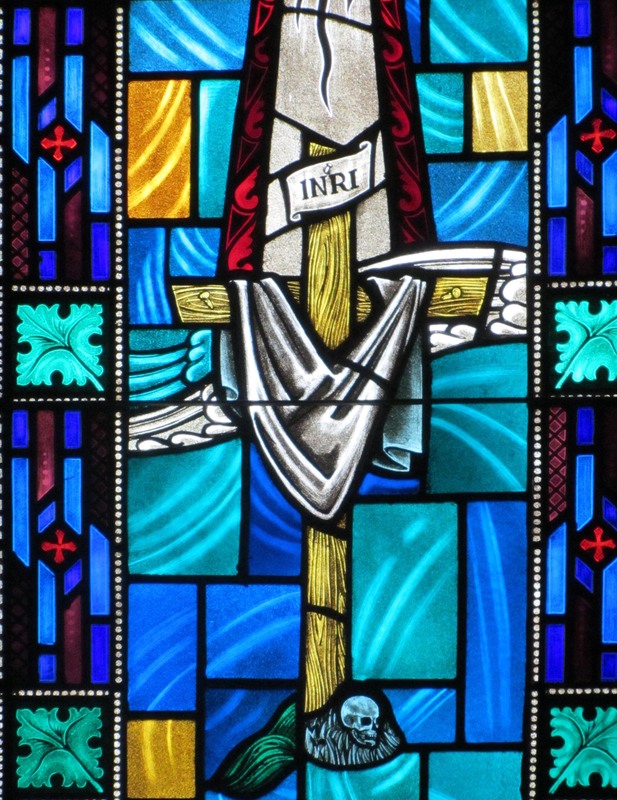 The Crucifixion window includes a chalice suggesting the Last Supper, thirty pieces of silver, a robe-draped Roman cross and skull “Golgotha” at its feet, and a phoenix within a burst of flame, a symbol of resurrection and hope. 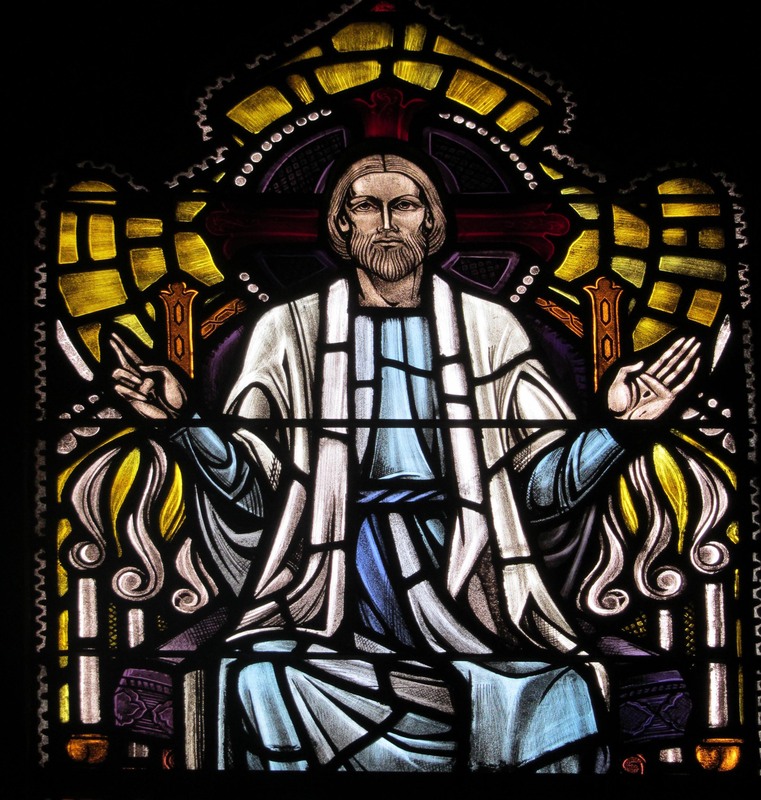 Finally, above the balcony, on the south end of the sanctuary, the Resurrection Window gloriously depicts the message of the resurrected Jesus-the Living Christ. 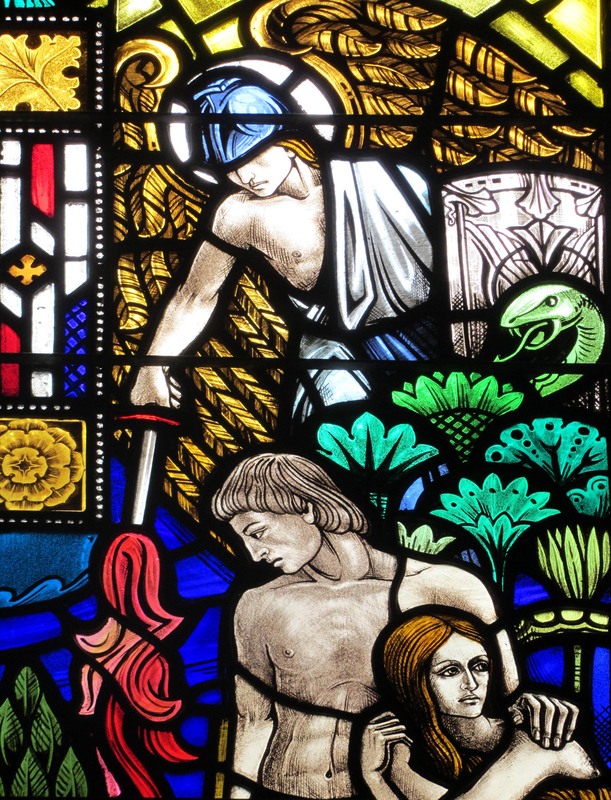 This window completes the sweep of Biblical history displayed throughout the sanctuary. 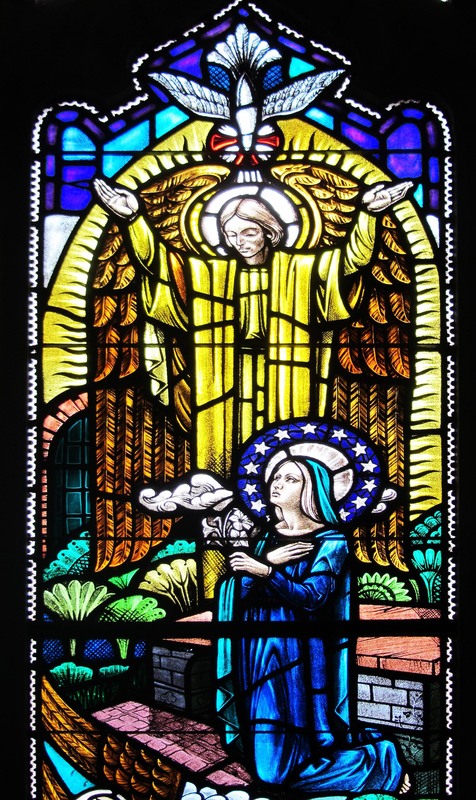 In the center is the Father with open hand emerging from a crown, the Son, robed in blue and white seated on a purple throne, and the Dove of the Holy Spirit, wings outstretched, in upward flight towards heaven. 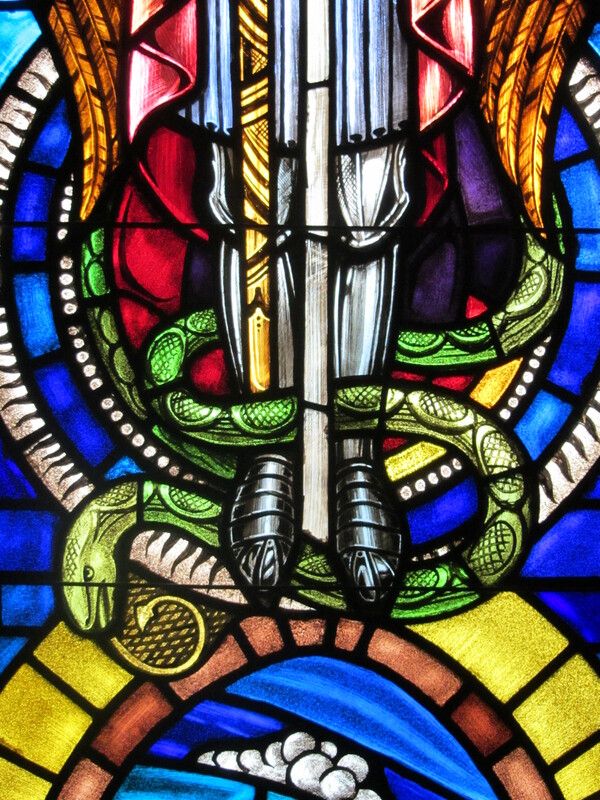 Below is the Lamb of God and Saint Michael, with his scales and standing on the conquered serpent. 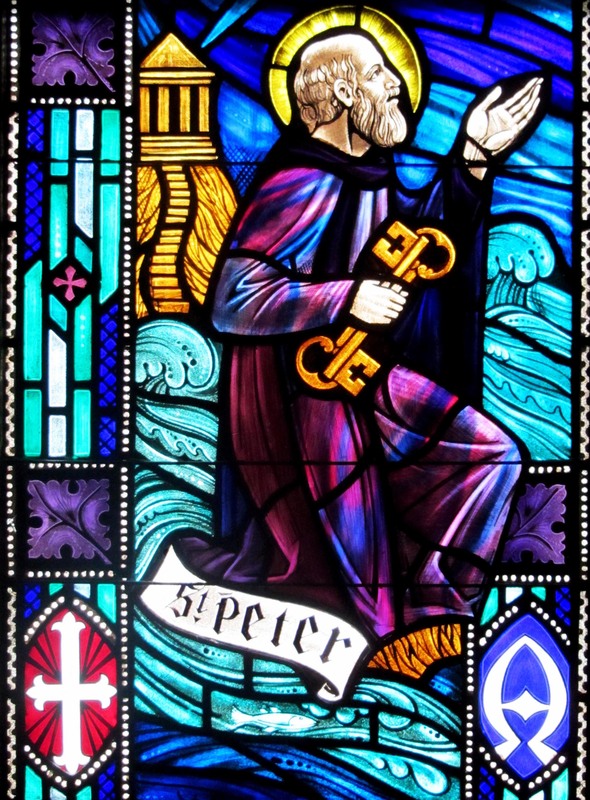 On the lower level we see Saint Peter on the left and Saint John on the right. 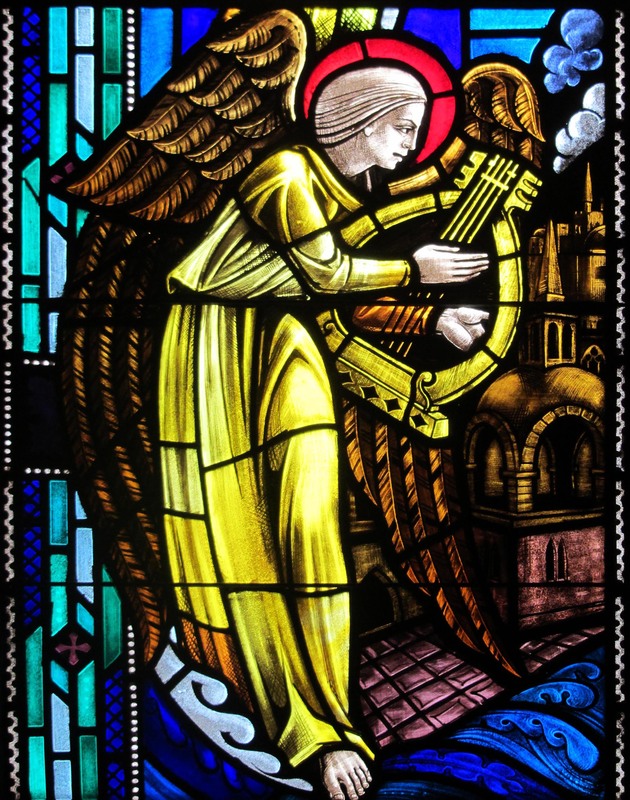 Throughout are glorious golden-robed angels playing joyous music. 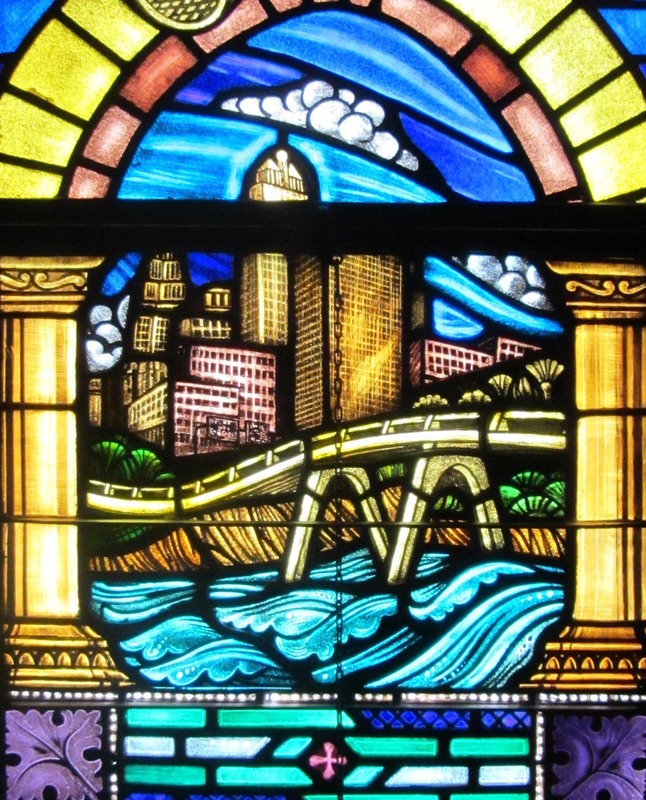 Reflecting the timeless truth that God is always and everywhere, the window includes two modern Kansas City scenes, one rural and one urban. 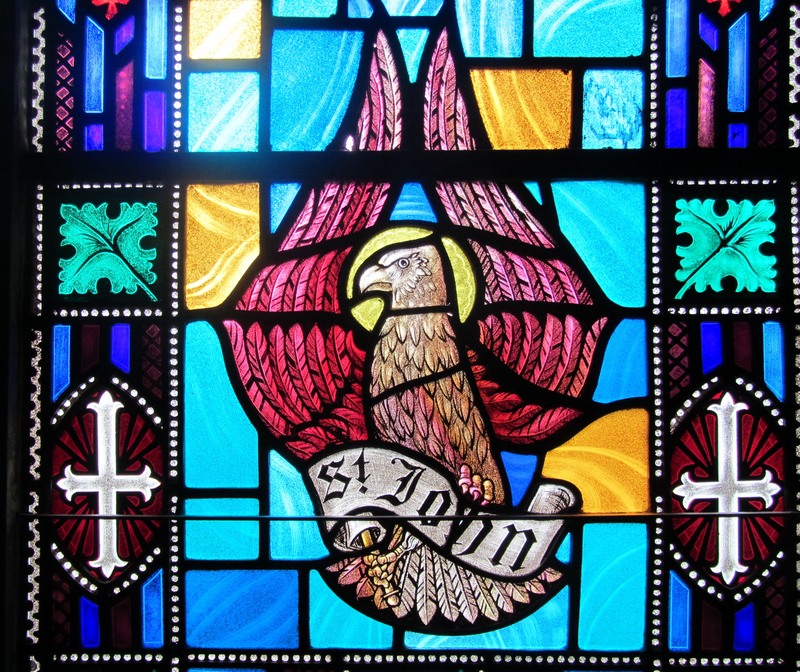 This beautiful church, itself risen like a phoenix from its own ashes, presents a thematically coherent pilgrimage through the scriptural foundations of Christian faith. 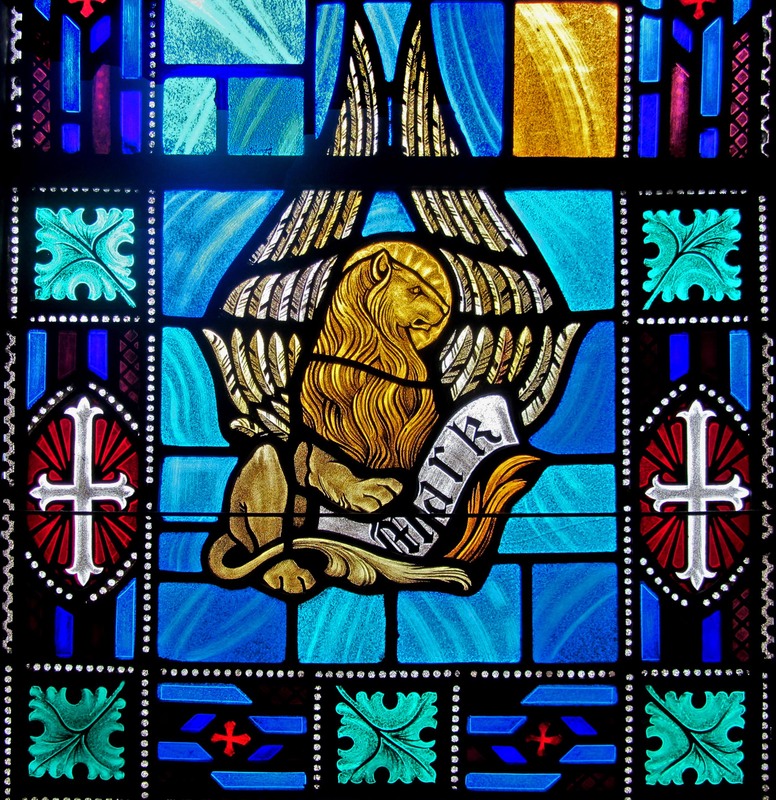 All of the windows were designed and fabricated by Kansas City artists and craftsmen. 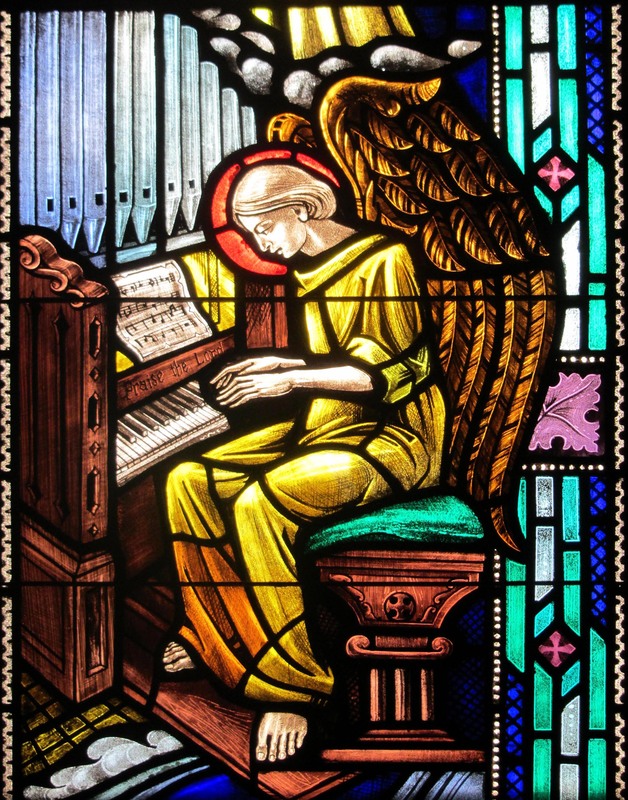 The artistry of this “Inspired Glass” provides a moving setting for spiritual inspiration and worship. Take a few more minutes and visit the Central United Methodist Church page located under “Churches” in this blog for more images and a fuller discussion of the windows here. 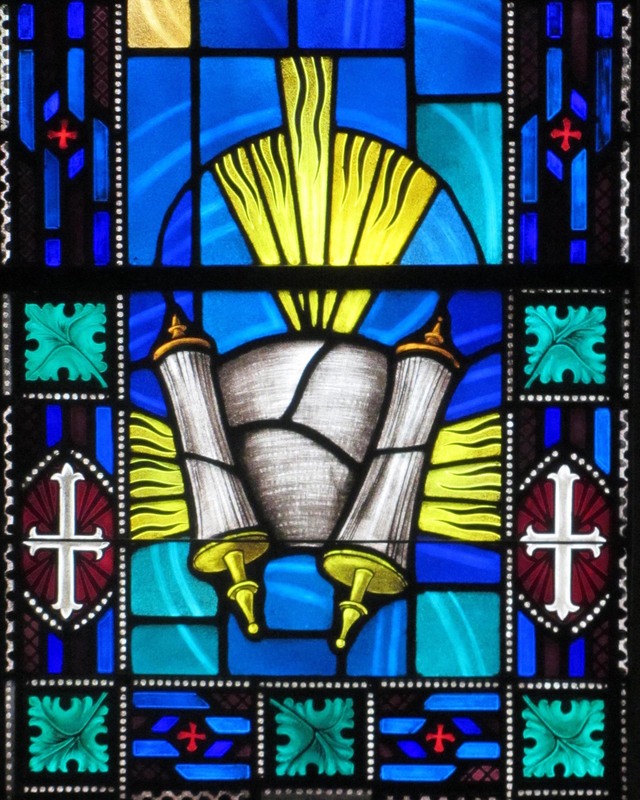 This entry was posted in 20th Century, Hebrew Bible, Hopcroft Art Glass Studio of KC, Kansas City, Missouri Area, New Testament, Uncategorized, United States, Willet. Bookmark the permalink. These windows are beautiful. I enjoy learning some of the history surrounding these windows, and always look forward to your posts. Thanks so much, Jill. I need to learn how to become more efficient in my posting. Another nice one should be up soon. It is good to know someone is enjoying these. Be Well.